Has a personal trial ever propelled you to focus on a grander vision? My pelvic floor path started in 1999 after the birth of my first son. I was a healthy physical therapist in my 20’s. The sudden onset of troublesome postpartum symptoms terrified me. I couldn’t sit on anything but a Boppy pillow for about eight weeks. I had pelvic pain, pelvic pressure, tailbone pain, urinary leakage, and a couple near misses with my bowels. I was confused and not sure what was normal. I recalled seeing a small ad in the PT Journal announcing a pelvic floor class that had caught my attention. Hoping this would give me some answers to my pain and symptoms, I enrolled for the course and anxiously awaited its arrival. During the first morning of the anatomy lecture, I was overwhelmed with awe and felt inspired that I was meant to share this message with others. Soon after, when the opportunity to start a private practice presented itself, I did just that with the help and support of my husband, family, the community, and the bank. Since 2000, it has been incredibly rewarding to help improve the quality of life of many men, women, and children in Central Texas. Pelvic floor disorders impact people in a variety of ways but frequently include feelings of hopelessness embarrassment pain, frustration, and fear. Over the years, I have wished many times for more resources to share with people that were easy to understand, high-quality, accessible online, available in the clients’ language, and weren’t expensive. Being unable to locate precisely the resources I envisioned, I set out to develop some. In 2017, the talented myPFM team began producing our first YouTube video titled Pelvic Floor Basics. With simple, high-quality anatomy images and animations, this video gives an overview of where the pelvic floor muscles are, what the pelvic floor muscles do, how the pelvic floor muscles work, and who can help with pelvic floor disorders, all in laymen’s terms. The feedback and support since our February 2018 release have been amazing and humbling. Pelvic Floor Basics has now been translated into Italian, Spanish and Korean and is available on YouTube and our website, myPFM.com. 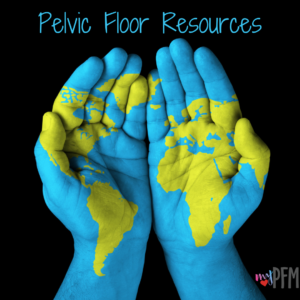 With growing social media connections, multiple therapists and healthcare providers from all over the world are stepping forward to help translate and narrate our first video “Pelvic Floor Basics” in their language too. Portuguese, Mandarin, Cantonese, Dutch, Russian, Ukrainian, and Hindi are all in the works. Our website is also translatable into several languages with the click on an icon. All over the world, so many people are suffering from pelvic floor disorders. With no cost, high-quality, accessible digital resources in a variety of languages, myPFM can spread hope, help, and healing to so many. That’s our goal. Passionately promoting pelvic floor health, awareness, and resources for all men, women, and children is the heart of myPFM.